Diary of Hendrik Brouwer (1769-1817), wine merchant in Middelburg and member of the city council. Zeeuws Archief | Zeeland Archives – Archive Family Brouwer, nr 1.
International Archives Day 2018 #IAD18 is coming up! Like every year Follow An Archive and Ask Archivists organize a celebration event on Twitter on June 9. With the celebration event we join the theme ‘Archives, Governance, Memory and Heritage’ of the International Council on Archives (ICA). The theme of the annual Twitter event will be: #archivesmemory. It’s about memories in archives, archives as memory of the community, our country, the world: our collective memory. But also memories of archivists and users of archives. We can say that all archives are memories. Or all archives contain memories. Archives form our collective memory. And all people who work in or with archives have memories of their work with archives, their visits to archives, their researches in archives, their participation in activities organized by archives and archivists. Lots of archives keep documents about memories in their collections. Think of letters, diaries, friendsbooks, postcards, photographs, drawings. But we can also think about documents of governments and organisations about all kinds of activities. All those documents can be a contribution to the Twitter event #archivesmemory. The format is quite open: tweet a scan, do an infographic, gif, animation, blogpost, podcast, flashmob, picture album – just make sure to tweet it, using the hashtag #archivesmemory. So, fellow archivists, let’s make a memory tour in our depots and show our most beautiful, special, memorable, valuable, extraordinary memory documents in our archives on June 9, International Archives Day, and contribute to ‘Archives, Governance, Memory and Heritage’! How can we show memory in our archives? Ego-documents, like diaries, letters, friendsbooks, photo albums, etc. Make online something fun with old diarys, letters, friendsbooks, drawings, photographs, postcards, posters, etc. – just gif it up! #archivesmemory: memories in archives. Let’s celebrate with #archivesmemory the ICA theme ‘Archives, Governance, Memory and Heritage’ and make a memorable #IAD18 of June 9! We just gave some exemples how to join #archivesmemory on June 9 on Twitter. Your contribution could naturally also be something completely different: documents of huge importance and great archival beauty that every archivist and every user and lover of archives must have seen. It is your choice, and we look forward to your contribution! Join International Archives Day on Twitter! We hope lots of archives, archivists and all people who love archives will join. Let us show together, using the hashtag #archivesmemory, how memories in archives can contribute to Governance and Heritage and how archives play a vital part in documenting the memory of the community, of the world, of the people who live on our planet. Sharing #archivesmemory gives us the oportunity to meat people via internet with the same love for archives, objects, a special year or for music or the joy of being an archivist or being a researcher. Twitter is the main platform for the event, but you can do #archivesmemory on most other platforms too. Show of your diaries on Instagram, take the opportunity to use the Facebook Live video, featuring memorable sounds of music, TV programs or films, write a blogpost… but be sure to tweet about it on June 9! This Twitter event #archivesmemory on #IAD18 is organized by Follow An Archive and Ask Archivists, managed by Charlotte S.H. Jensen (Denmark) and Anneke van Waarden-Koets (The Netherlands). We wish you a great International Archives Day on June 9 and we are looking forward to your #archivesmemory! Belgian advertisment for a day trip to the isle of Walcheren, Province Zeeland in The Netherlands, 1892. Zeeland Archives in Middelburg | Zeeuws Archief, Zeeuws Genootschap, Zelandia Illustrata III, no. 1071.
International Archives Day 2017 #IAD17 is coming up! Like every year Follow An Archive and Ask Archivists organize a celebration event on Twitter on June 9. With the celebration event we join the June 9 theme ‘Archives, Citizenship and Interculturalism’ of the International Council on Archives (ICA). The theme of the annual Twitter event will be: #archivestourism. It’s about tourism in archives. Tourism makes a great match with the ICA theme ‘Archives, Citizenship and Interculturalism’! Tourism also perfectly matches the 2017 theme of the United Nations: ‘International Year of Sustainable Tourism for Development’, #IY2017. Lots of archives keep documents about tourism in their collections. Think of brochures, postcards, photographs taken on holidays in family archives, films and think of archives of tourist shops or tourist organisations. They all can be a contribution to the Twitter event #archivestourism. The format is quite open, do an infographic, gif, animation, blogpost, podcast, flashmob, picture album – just make sure to tweet it, using the hashtag. So, fellow archivists, let’s make a tourist tour in our depots and show our most beautiful, special, valuable, extraordinary tourism documents in our archives on June 9, International Archives Day, and contribute to Archives, Citizenship and Interculturalism! How can we show tourism in our archives? Brochures of countries, cities, villages, tourist attractions, tourists events, etc. Sound, video, film, advertising countries, cities, villages, tourist attractions, tourist events, etc. Make something online and fun with old posters etc. – just gif it up! #archivestourism: tourism in archives. Let’s celebrate with #archivestourism the ICA theme ‘Archives, Citizenship and Interculturalism’ and make a touristical #IAD17 of June 9! We just gave some exemples how to join #archivestourism on June 9 on Twitter. Your contribution could naturally also be something completely different: documents of huge importance and great archival beauty that every tourist (and your own citizens!) must have seen. It is your choice, and we look forward to your contribution. Let us show together, using the hashtag #archivestourism, how tourism in archives can contribute to Citizenship and Interculturalism and how archives play a vital part in documenting the history of tourism. If you wish to join, make a comment below stating your Twitter handle as “reply” to this post. And on June 9th post your content to relevant platforms – blogs, Flickr, Instagram, your website, etc. – and tweet about it using the combination of two tags: #IAD17 #archivestourism. This Twitter event #IAD17 #archivestourism is organized by Follow An Archive and Ask Archivists, managed by Charlotte S.H. Jensen (Denmark) and Anneke van Waarden-Koets (The Netherlands). We wish you a great International Archives Day on June 9 and we are looking forward to your #archivestourism! Who would like to translate this blogpost into his/her own language? Feel free to use the blogtext above and use your own pictures to give exemples. Please let us know on Twitter when you have written a blogpost in your own language about the Twitter event #archivestourism on June 9 #IAD17, so we can make a link to your blogpost. Together we can spread the word worldwide to let as many people as possible know about #IAD17 #archivestourism on Twitter. Thanks a lot! Pamphlets from the Danish Tourist Board in Danish National Archives. Lots of vikings and nostalgia going on. Parade of ‘Rederijkers’ making music in Middelburg (province Zeeland, The Netherlands). 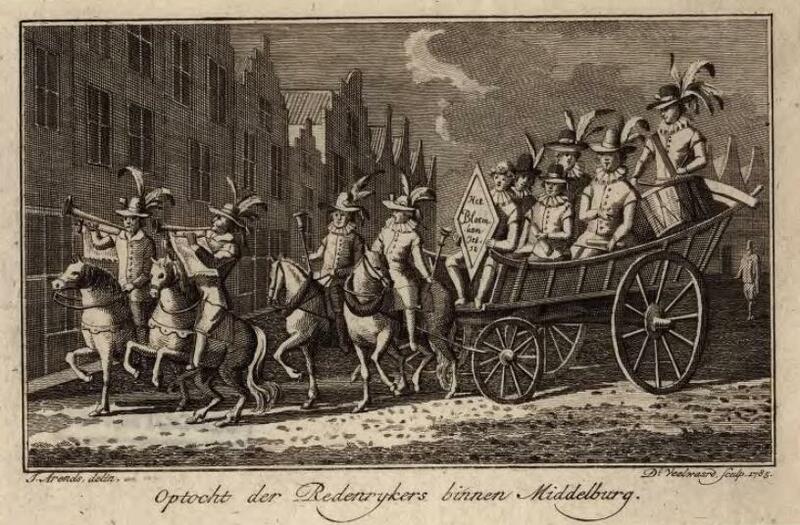 Engraving by Daniël Veelwaard and Jan Arends, ca 1784/1785. Zeeuws Archief/Zeeland Archives, Zeeuws Genootschap, Zelandia Illustrata, dl III, nr 988.
International Archives Day 2016 #IAD16 is coming up! Like every year Follow An Archive and Ask Archivists organize a celebration event on Twitter. Music makes a perfect match with the ICA theme ‘Archives, Harmony and Friendship’! Remember the song ‘Ebony and Ivory’, a 1982 number-one single by Paul McCartney and Stevie Wonder? “Ebony and ivory live together in perfect harmony | Side by side on my piano…”. It contains music and lyrics worth to keep in an archive, performed by two friends singing and playing together in perfect harmony! So let archives rock on June 9, International Archives Day, and contribute to Friendship and Harmony! How can you let archives rock? Music performances and/or instruments on photographs, engravings, paintings, etc. Music in archives, sounds in archives, it’s all possible to make #archivesrock on June 9! 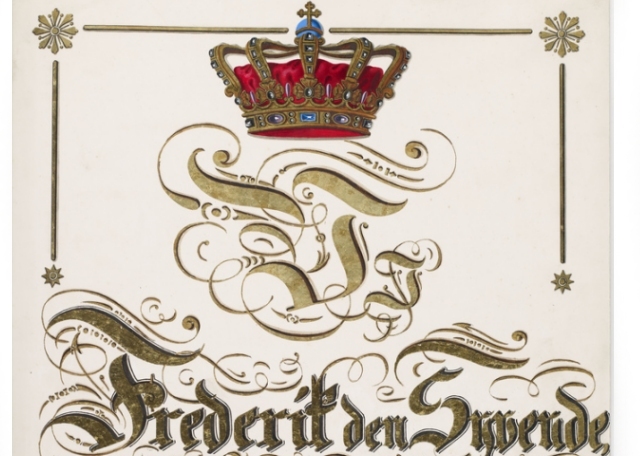 And finally – your contribution could naturally also be musical documents of huge importance and great archival beauty. Let us show together how music can make the world a harmonious place to live together in friendship and how archives play a vital part in documenting the history of music. If you wish to join, make a comment below stating your Twitter handle as “reply” to this post. And on June 9th. post your content to relevant platforms – blogs, flickr, instagram, your website, etc. – and tweet about it using the combination of two tags: #IAD16 #archivesrock. This Twitter event #IAD16 #archivesrock is organized by Follow An Archive and Ask Archivists, managed by Charlotte S H Jensen (Denmark) and Anneke van Waarden-Koets (The Netherlands). The idea for the theme ‘the sound of archives’ came from the German archivist Thomas Wolf. We added music, mixed it with the sound of archives, and here it is, especially for all our archives friends: a harmonious theme to celebrate International Archives Day: #archivesrock! Entry of baptism for the world-famous Danish composer Niels Wilhelm Gade, 1817. He was co-founder of the Royal Danish Academy of Music, where he became the first Director General. In 1854 he wrote a “weddingwaltz” for a play and didn´t think much of it. But even today, it is used at almost every Danish wedding and silver/gold wedding aniversary. Archivists from several countries in the world wrote blogposts about the Twitter event #archivesrock on #IAD16 in their own languages. Thank you very much for your great translation work, colleagues! Much appreciated! June 9th. and International Archives Day is almost here again. There are so many topics to choose from! But we propose, that this years activities concentrate on democracy in many ways. The National Archives of the United Kingdom has come up with this topic, suggesting that we make June 9th. a “Twitter day where archives share stories and records within their collection showcasing democracy and rights in different ways”. It is a subject, that most archives can relate to and tell stores about. No matter if you are a large, national archive, a municipal institution or a community archive, we all have records and other material, that can be used to tell the story of democratic development, and people who have stood up for their rights. sound archives with important speaches, interviews etc. And finally – your contribution could naturally also be constitutional documents of huge importance and great archival beauty. It is your choice, and we look forward to your contribution. If you wish to join, make a comment below stating your Twitter handle as “reply” to this post. And on June 9th. post your content to relevant platforms – blogs, flickr, instagram, your website, etc. – and tweet about it using the combination of two tags: #IAD15 #democracy. We hope a lot of archives will join, and help show the world, how archives play a vital part in documenting the history of democracy. This Twitter event #IAD15 #democracy is organized by Follow An Archive and Ask Archivists. Cartoon on the friction between two political parties in Dutch elections (scale based on the balance in Middelburg, province of Zeeland). Lithography by Joh. Braakensiek, 1897. 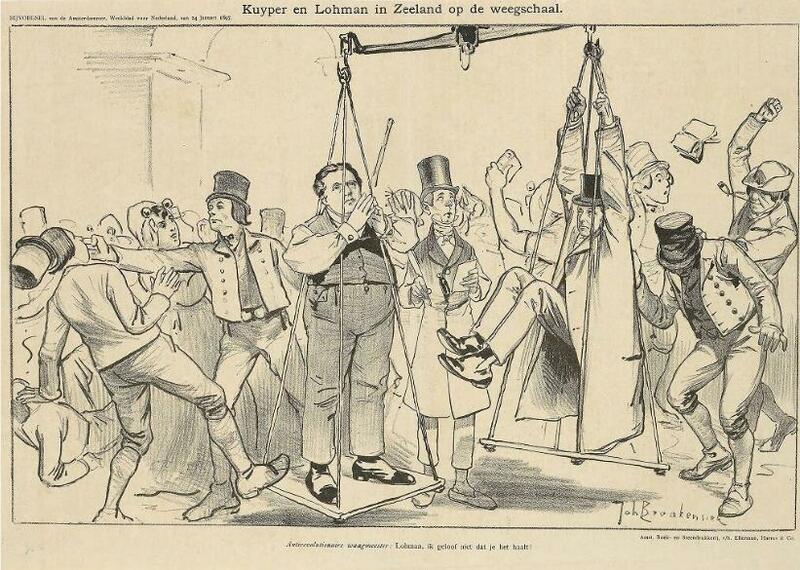 Source: Zeeuws Archief-Zeeland Archives, Zeeuws Genootschap, Zelandia Illustrata III, no. 362. 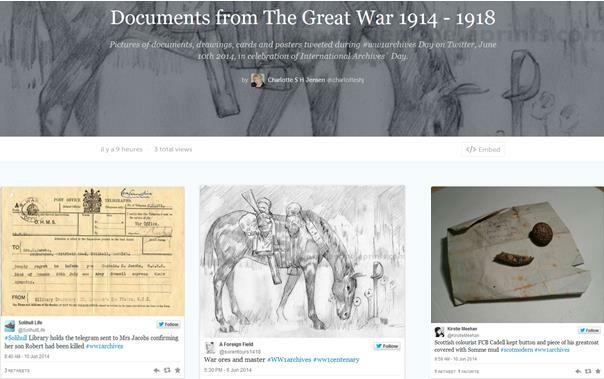 What a great day we had on June 10, 2014, celebrating International Archives Day with the Twitter event #WW1archives! Lots of archives, liraries, museums, other heritage organisations and tweeps participated, tweeting about the First World War in their archives or private collections. #WW1archives Day started in New Zealand and Australia with at least seven organisations and tweeps tweeting about the Great War in their archives and collections. Other participating countries followed, most of them in Europe (we counted 14 twittering organisations in The Netherlands, but the UK and France were leading on tweets), but also in South-Africa and the Middle-East. And the last countries that joined #WW1archives were the America’s and Canada, who also did a great job. Almost 1,000 users did more than 2,000 tweets and retweets with a potential reach of almost 1,600,000 and over 5,300,000 impressions. We enjoyed the documents, pictures, objects and all kinds of resources. It’s amazing to see what a treasures we keep in our archives and collections! And we saw a lot of data bases to search for soldiers and refugees. Good work! We also saw private persons who made wonderful projects or stories of their search for ancestors who were soldier of refugee in the Great War, and persons who shared their privat collections of, for instance, magazines or postcards. Thanks for your special contributions! We hope you enjoyed participating #WW1archives! The idea to tweet about the First World War in archives and collections came from Thomas Wolf from SIWI-archives in Germany. Do you have an idea for a next international Twitter event on @FollowAnArchive and @AskArchivists? Please let us know. Thanks to you all for making #WW1archives Day such a great archives event, to show all the resources we keep for people to investigate and make the discovery of their live! 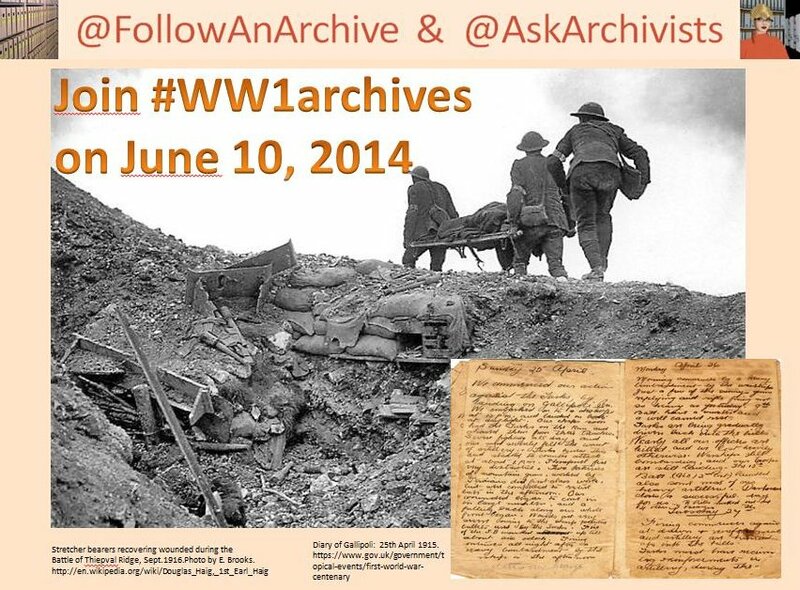 Join @AskArchivists and @FollowAnArchive on #WW1archives Day on Twitter, June 10, 2014. In due time you will find more information on the two blogs https://askarchivists.wordpress.com/ and http://followanarchive.blogspot.nl/ . This tweet was the beginning of great fun in archives! Archivists of the Dutch Regionaal Archief Tilburg came up with this fantastic idea as a follow up of #shelfie (a picture or portrait of your bookshelf). They thought: “Why not a picture or portrait of your favorite archive shelf?” And so #ArchiveShelfie was born. Archivists and visitors of archives came up with awesome pictures. Not only shelves with boxes, papers and all other kinds of archival stuff were recorded on camera, but also minuature archivists made of paper or Lego, and even an archive dwarf, showed up. You can see all this amazing pictures in the Storify of #ArchiveShelfie. The event #ArchiveShelfie is still going on and will be for as long as it takes. So… join the event and be creative with yourselve, your shelves and your archives! Thanks to the collegues of the Regionaal Archief Tilburg, who started this event on Twitter, for coming up with such a great idea! 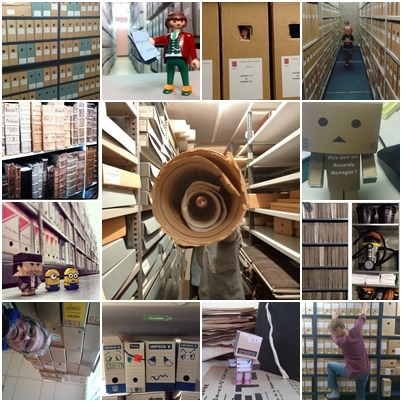 Have lots of fun making your own #ArchiveShelfie!